George Bowler Tullidge III was an ordinary “All-American” boy who chose to serve his country as a member of the 82nd Airborne, 507th PIR during WWII. George jumped in the early morning hours of June 6th as part of Operation Overlord. He was to find himself engaged in battle with German forces around La Fier Bridge near St. Mere Eglise, France. George was wounded during the battle, died a few days later and was awarded the Bronze Star for Bravery. This is his story as told through eyes of his grieving mother, supplemented with many letters from George as well as his comrades. Among his possessions that day was a booklet his mama had given to him prior to his leaving for basic training. In that booklet were words of encouragement that she had borrowed from many sources including the Bible. After George’s death, his mama published that booklet as “A Paratrooper’s Faith”. This booklet is still being published today, by George’s sister and distributed to all who ask. 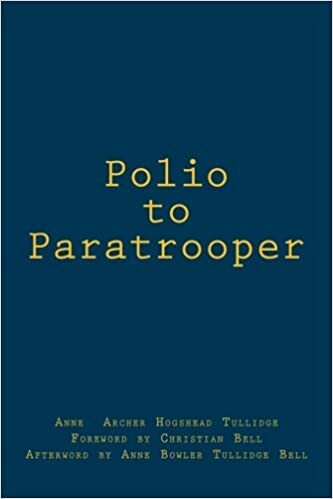 The proceeds from the sale of Polio to Paratrooper will be donated to organizations that support our armed forces. This book was originally written for each member of our family for George’s story and life to live on. Now, I am the last member of the immediate family. My son, Christian, loved hearing about his uncle George from his Oma. This has been a dream of his, to publish this story, similar to many other brave men who went to war. We hope that this book will inspire, comfort, educated, and thank our heroes from the Greatest Generation ! We also have a website where you can ask for a free copy of A Paratrooper’s Faith . This entry was posted in Uncategorized, USA and tagged A Paratrooper's Faith, D-Day, death, George Bowler Tullidge III, Greatest Education, grief, Heroes, leadership, paratrooper, Polio to Paratrooper, sacrifice, WWII. Bookmark the permalink. This book was a fantastic read! so heartfelt and real. Another great addition to my 507th PIR library. I’m blessed to have an original war time copy of “A Paratroopers Faith” I highly recommend both of these items to be owned and read!